The Santhal community of East India states like West Bengal, Jharkhand and Assam had their own style of folk paintings which are called Pats. 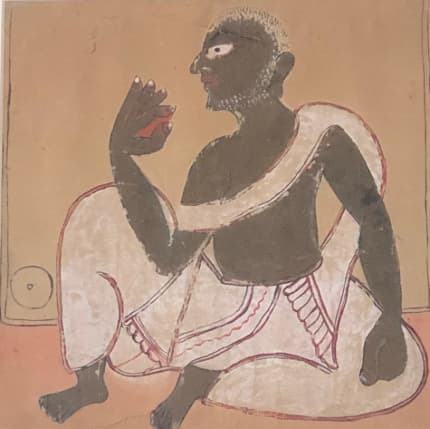 The artist (or Patua) would make images with tempera and would use natural and locally found pigments in their art.The name Chaksudan pat comes from the area in which they were made. Just as the name Kalighat pat has a location based identity, Chaksudan is similarly named. Chaksudan pats had ordinary rural people as its subject matter and were used for illustrated travel story books in performances. Although they were drawn in a flat manner, there were always intricate details that gave the viewer an idea of what the Patua saw in his everyday life. Making pats was also a traditional occupation as these traditions were handed down by the generation above them. Sold at Rs 19,500 by StoryLtd.